This Article is being provided to help the consumer understand how the local broadcasters can and do impact your cable bill. First lets look at the how and why a Broadcast station can impact your cable bill. Retransmission consent is a provision of the 1992 United States Cable Television Consumer Protection and Competition Act that requires cable operators and other multichannel video programming distributors (MVPDs) to obtain permission from broadcasters before carrying their programming. A broadcast station (or its affiliated/parent broadcast network) may propose that the cable operator, such as Sister Lakes Cable, pay cash to carry the station or ask for any other form of consideration, such as an additional channel for supplementary programs. The cable operator may also refuse the broadcaster’s proposal, in which case the station may refuse to allow the cable operator to retransmit its signal. The Communications Act requires that a television station give its consent to a cable system or other multi-channel video programming distributor (MVPD) to carry its broadcast signal. Television stations and cable systems, as well as satellite carriers, negotiate for this “retransmission consent” and money or other consideration is generally exchanged between the parties in these private negotiations. If the parties do not produce an agreement in time, they may decide to extend the existing agreement, which means they would continue to carry the stations during their negotiations. If they do not reach an agreement, then the cable system or other MVPD must stop offering the stations to their subscribers. Now lets talk about who is driving prices for the programs you are watching. Sinclair Broadcasting may not be a name you hear often. Here is a bit of their Bio from their website. Sinclair Broadcast Group, Inc. is one of the largest and most diversified television broadcasting companies in the country. Sinclair owns and operates, programs or provides sales services to more television stations than anyone and has affiliations with all the major networks. In addition, Sinclair is the leading local news provider in the country, as well as a producer of sports content. Sinclair owns a multicast network, four radio stations and a cable network. Sinclair’s broadcast content is delivered via multiple-platforms, including over-the-air, multi-channel video program distributors, and digital platforms. Sinclair, either directly or through its venture subsidiaries, makes equity investments in strategic companies. Sinclair Broadcast Group, Inc. was founded in 1986, went public in 1995 and is traded on the NASDAQ Global Select Market under the ticker symbol SBGI. Sinclair Proudly announces they own 193 television stations, 575 Channels of programming in 89 markets in the United States. Some will recall WSBT just recently acquired WSJV’s Fox. This was acquisition by Sinclair Broadcasting the parent company. Now we have addressed the legal side of why and the who we are dealing with we need to look at why negotiations are important to help keep costs down. 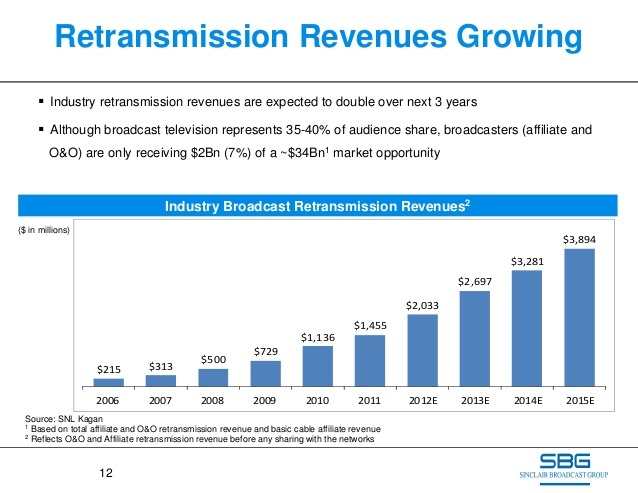 Retransmission fees are the #1 driver of increases in cable prices for consumers these days. Sinclair already gets some of the highest rates in the country; their rates increased over 40% per subscriber last year alone. As a result, customers’ bills will increase to the point where they may be a burden to many. Congress, in Section 325 of the Communications Act, sought to reduce the likelihood that TV viewers would face this roadblock. The law requires broadcasters and multichannel video programming distributors (MVPDs) to negotiate for retransmission consent in good faith. Congress gave the Commission the authority to keep an eye on these negotiations, and our rules include a two-part framework to determine whether broadcasters and MVPDs are negotiating in good faith. First, the Commission has established a list of nine objective standards, the violation of which is considered a per se breach of the good faith negotiation obligation. Second, even if the specific standards are met, the Commission may consider whether, based on the totality of the circumstances, a party failed to negotiate retransmission consent in good faith. What we have seen as good faith at this point is take it or leave it. Our Co-Op the NCTC has issued this statement our retransmission consent negotiations with Sinclair Broadcast Group have reached an impasse and our discussions with them have ceased. How can Good Faith negotiations fail, Simple they want more of your money and we are fighting to keep your costs down. So as one to ask for help in this fight, I am going to provide a few contacts at Sinclair if people would wish to weigh in on your cable bill increasing.